As you’ve probably noted, the vast majority of the animal rescue groups selected for our grants are small non-profits who typically operate on shoestring budgets. In many cases, the only assets these heart-full groups have are the people dedicated to aiding homeless and abused companion animals. Frequently located in small communities, these affiliations fulfill a vital need in under-served areas of the U.S. Not only do they accomplish so much with so few resources, they work every day to relieve suffering and enrich their communities. In recent months, we have explored gifts made to Golden Rescue South Florida, Palmetto Animal League of South Carolina and Dachshund Rescue South Florida. In what follows, we provide a brief summary of the other eight rescue groups who have received grants so far this year. In 2003, Noah's Ark opened a small feline adoption center in Pompano Beach, FL. The cats are humanely trapped, tested for disease, spayed and/or neutered, and vaccinated. And although they do not have a physical shelter for dogs, they do not hesitate to rescue the strays they encounter, placing them with volunteer foster parents. Their ultimate goal is to create a no-cage, no-kill shelter with sufficient fenced area for healthy feral cats to roam freely and safely, and to house stray and abandoned dogs in a home-like setting with room to run. In operation since 2007 and located in St. Clair Shores, MI, the Lily’s Love Foundation helps not only families in need, but the companion animals of those families, too. Through Gabe’s Gang Pet Soup Kitchen, they offer free and low-cost pet food to families in financial crisis, because they want to make sure that these beloved creatures are never hungry and always happy. They never want a family to have to surrender temporarily or permanently abandon their furry companions due to financial difficulties. And, through Toby’s Toy Box, they provide families with toys, blankets, beds, grooming services and routine veterinary care … in some cases, at no cost to the recipients. Another breed-specific rescue group, this organization places abandoned coonhounds with foster homes until appropriate adoptive families can be matched with these quintessentially American dogs. They care for dozens of dogs, rescued from locations throughout the country. Covering all veterinary expenses, and food costs for foster homes when they can, this is an excellent group deserving of extra help. Located in Pine Village, IN, the We Care Animal Rescue has an ambitious agenda. Through their thorough and diligent work, they seek to: effect social change locally, nationally and globally through education and actions to ensure that animals are regarded as loving companions; to provide emergency foster care for pets at risk, abused, and victims of domestic violence or mental illness; to assist in finding loving and responsible homes for dogs; to alleviate the overpopulation problem in urban and rural communities by promoting and assisting in spay/neuter campaigns; and to provide a caring sanctuary for unadoptable animals that allows them to live out their natural lives with love and dignity. We wholeheartedly support their vital work on so many fronts. Located in Elida, OH, this group’s primary mission is to rescue, rehabilitate and re-home toy dogs – especially Yorkshire Terriers. Secondarily, they are vocal advocates for legal challenges to laws that allow for the commercial abuse of Yorkshire Terriers and other companion animals. Additionally, they work to prevent cruelty and abuse of companion animals and to educate local populations about the importance of spaying and neutering companion animals. The funds donated to Petite Paws were used exclusively to cover the costs of necessary veterinary care. Founded in 2000, this charitable, non-profit group is comprised of Texan volunteers who donate their time, give according to their abilities and, in some cases, even open their homes, all to help place Collies with loving families. Their main goals are to protect the breed from suffering the indignities of abuse, neglect and homelessness, to prevent further over-breeding of Collies, and to educate pet parents about better Collie care if they need assistance. Community Sharing was created in 2003 as an expansion of an existing food pantry serving the Milford area of Michigan. While their initial goal was to help their clients achieve financial independence, they began a new arm of their group in 2004 called the Outreach Pet Pantry. The stated mission of this group is to provide sufficient pet food to feed their clients’ cats and dogs for a month at a time. Their hard work often means that low-income families can keep their companion animals in their homes, rather than having to abandon their pets to local shelters. In addition to pet food, they also provide kitty litter, treats, beds, bowls and more, dependent upon the amount of donations they receive. This rescue used funds from our foundation to provide free and low-cost spaying/neutering to the local community, which has been dramatically impacted by the economic turmoil of recent years. 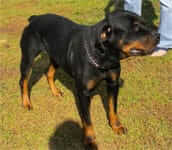 In 2000, Rising Star Rottweiler Rescue, Inc. was founded in Lake Worth, FL, for the sole purpose of rescuing, retraining and relocating abandoned Rottweilers. All potential pet parents are thoroughly reviewed and a home visit is required, to be certain that each dog will be more than adequately cared for and readily welcomed as part of its new family. All funds donated to Rising Star go directly to medical expenses associated with inoculations, spaying/neutering, and identification devices (like microchips or tattoos) for rescued Rottweilers. Through social gatherings, picnics, and fun training matches, the members of the Rising Star family keep in touch with one another to keep open lines of support and communication. The funds donated by our foundation were used to cover veterinary expenses for several Rotties. Based upon the information that we’ve received from all of the recipients of our foundation’s funds, we estimate that, in total, we have been able to help hundreds of dogs and cats to enjoy healthier, happier lives. And we look forward to sharing news of our next round of financial grants, to rescue groups just as committed as those mentioned above, in the very near future. Again, for making the good work of the Dr. Jane’s HealthyPetNet Foundation possible, we thank you for your continued business. Thank you for all you are doing for the animals. I love hearing about all the rescues the Foundation has helped. Hi, I am a volunteer board member for an animal rescue in California, we are a 501(c) rescue, The Amanda Foundation. We rescue cats and dogs from city shelters, and also run a free spay and neuter program for low income pet parents. How do we go about applying for one of your grants.